On a Wednesday night midway through the World Cup, Dasha Petrova was enjoying a glass of wine with her sister when the large blue “Super Like” notification appeared on her iPhone. Petrova, 26, is one of thousands of Tinder users who have boosted traffic to the dating app since the World Cup kicked off. 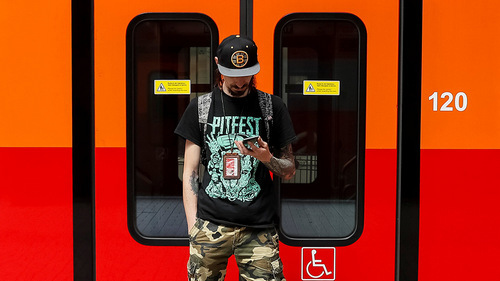 The Megafon provider told The Moscow Times it had registered an almost four-fold increase in traffic to Tinder on July 1 compared to early June, before the start of the tournament. But not everyone using the app during the tournament is looking for the love of their lives. Many, like Petrova, who had only recently reinstalled the app, were on it “for fun” and to meet some of the foreigners flocking to Russia. Alexandra Belyayeva, a 26-year-old journalist, told The Moscow Times that because so few Russians travel abroad, being active on Tinder during the World Cup’s influx of football supporters from abroad was a fast track to meeting foreigners. According to a 2018 survey published by the independent Levada Center pollster, 76 percent of Russians don’t own travel documents that allow them to leave the country and 68 percent have never traveled abroad. People were dressed up like freaks, guzzling vodka and screaming along to 90s Russian pop hits. 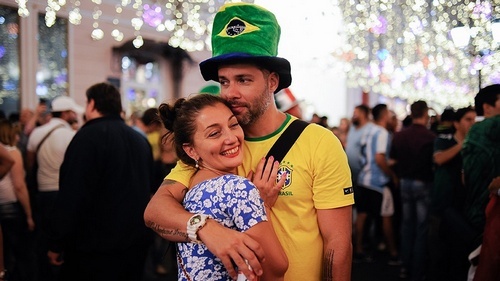 Belyayeva told The Moscow Times she had created her Tinder account one week into the World Cup for friendship, not romance. “I’ve been to Europe many times, and there people take pleasure in showing me all the quirks of their culture,” she said. Now, for the first time, Belyayeva had the opportunity to flaunt her own country. Her first night using Tinder, Belyayeva decided to invite a trio of Australian fans to accompany her and her friend to a trashy 90s-themed disco. But what should have been a catastrophe in the making turned out to be a very pleasant night. “We translated all the songs for them, and at a certain point they even started to sing along,” she recalled. The Australians particularly enjoyed a song about the despair in realizing that there’s only one glass of vodka left, she said. Many Tinder users who spoke to The Moscow Times also complained that Russian men are just as difficult behind the touchscreen as they are on the dance floor. “Russian men are spoiled with attention, so they’re very passive on Tinder,” Masha Karparova, 29, said. “Before the World Cup I’d have to boost my page, and would still only get five to 10 likes a week,” Masha explained. With the influx of foreign tourists, Masha now gets up to 100 likes a day. Through Tinder, Karparova, who works in marketing, formed a fast friendship with a young man from Mexico. A Frenchman who she never met because she overslept their scheduled date is now promising to return to Russia just to meet her. Not everyone’s experience has been positive, however. Mikhail Zakharov, a young, openly gay Muscovite, had high hopes for his World Cup Tinder experience. “My conversations with Russian guys often feel strained: There’s just no culture of small talk here,” Zakharov, 21, said. But Zakharov’s Tinder experience did not live up to his expectations. Unfortunately, the American student spent the whole three-hour date asking Zakharov where he could find illegal drugs in Moscow.